ELV doesn’t know where to start when describing the Simon Brunch at the Palms Place Pool. The sensory overload is almost too much for his middle-aged brain. But the food is fun (if not fabulous), and there’s no denying the appeal of watching lots of young women eating in their sleepwear. If you get tired of looking at them, there might be Jerry Tarkanian at the next table — chowing down with the sort of weathered, Runyonesque guys who have done so much for his reputation over the years — to distract you. And you can’t miss all the tilted trucker caps….and the Ed Hardy shirts…and the general douchebagginess of all the young dudes, who are there for the eye candy as much as the menu. They’re fun to mock amidst sips of your do-it-yourself Bloody Mary. And mock them you do,* for they interfere with your buzz and your digestion. And don’t forget the fat folks. Like all buffets, this one (as uber-cool as it may be), is well-stocked with the adipose set. Cheek by cheek and jowl by jowl they jostle with the overly tattooed and Christian Audigier-ers for a spot on the overeating line. For the sake of his digestion last Sunday morning, ELV was glad Tark The Shark didn’t get the memo. Once you’re there, head to the Bloody Mary bar, pay your $7, and go nuts dressing up your tomato juice and vodka concoction with everything from Dave’s Flaming Sphincter hot sauce, to horseradish by the bucketful, to pickled asparagus. 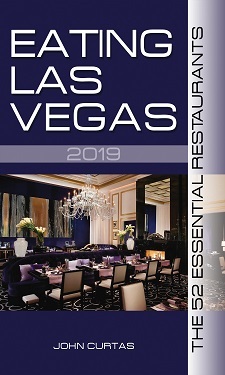 For $38/person you also get unlimited access to a sushi chef, pastries, Fruit Loops (FYI: ELV and his staff have a thing for sweet, high-fructose coated, childish breakfast cereals), a sandwich maker, a giant barrel of huge poached shrimp, and an entire printed menu. Feeling his white trash roots,** ELV went straight for the chicken and waffles off that menu, and true to form, they tasted just like you’d expect down-home, deep-fried, lard-based cooking would when interpreted by a top-grade chef. In other words, the chicken wasn’t greasy enough, and Kerry Simon’s attempt to liven up thin, skinless breasts by coating them with rosemary-infused breading reminded us of what happens when talented cooks try to gussy up barbecue — it becomes too civilized and thus, denuded of character. But we can forgive Simon that transgression because the rest of what ELV and uber-foodie Sarah Lee Marks tried was definitely top shelf. The chilaquiles weren’t up(?) to Mexican dive standards, but were pretty good for a gringo chef, and the breakfast pizza (thin-crust covered with good cheese, bits of ham and a fried egg) — worth going back for. A croissant and pain au chocolat hardly approached Lenotre or Payard standards, but were passable enough, and the vegetarian panini (tomato, herbs, mozzarella, zucchini) a tasty alternative for non-meat eaters. We didn’t get to the sushi, but the on-premises sushi chef seemed to be taking his work very seriously. On the down side, of the six desserts tried, three of them (the chocolate chip cookie, the brownie, and the rice krispy treats) were stale. By that we mean they were a lot less moist than they should have been. But let’s face it who cares? This place is more about fun than food, and Kerry Simon delivers the goods. He’s one chef who is always in his restaurant, and the languidly-locked one may be resuscitating breakfast into a meal we can get excited about again — with or without unsavory basketball coaches in our midst. * Should you need assistance in spotting the Scrotal-Greico-Virus-infected douchebags of the world, ELV refers you to the Boasian “Four Field Approach” anthropological research found at the Web site: www.hotchickswithdouchebags.com. ** Although Pennsylvanian and Connecticut to his core, ELV was ed-gee-kated in Kentucky, Tennessee and Florida. That’s where he learned to speak and write gooder. Hope you enjoyed your dinner at society last week. hahah. Certainly sounds hip! Have been invited many times; for some reason, have not gone. Now I must go to see if I can come up with a better description thatn you did, but I doubt it — well written, as usual! Ok, I am now more confused regarding if I should go or not… people watching is fun but $40 worth, I’m not sure… the food is good but is it good enough? I think based on your observations, a guy would consider the view plus food a value but would I as a woman who is not overly excited by seeing young chickies in pjs? Alas my friend, there you go using all those BIG words to describe the eye-candy fest, yet failing to mention the Mary Janes, Smarties, Skittles and M&M’s for all those partaking and not finding enough sugar to rub on their thighs. JC you are such a kill joy when you mention calories;-( Leave us to our cake and let us eat it too! Aside from the enticing photo showing the new fashion of eating brunch without clothes (below the waist), I’m not overly excited to stuff myself at the Simon Brunch next time I’m in town. True, Chef Simon seems to always attract the tattooed-trendy crowd. And yes, they seem to always have fun digging into his funky takes on meatloaf and mini-burgers. Call me old-fashioned, but I find it terribly hard to get excited over silly fluffs of cotton candy from the hands of the “rock-star” Chef.